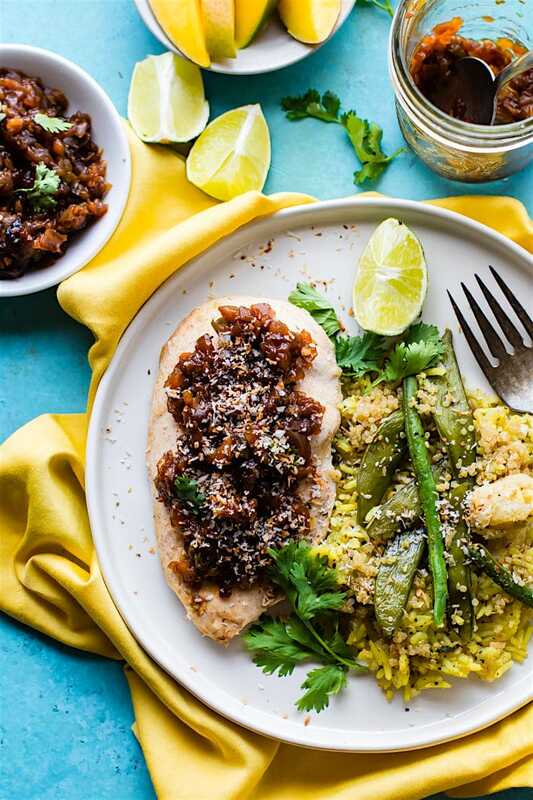 Coconut Milk Chicken with Jalapeño Mango Chutney is a dairy-free and gluten-free marinated chicken recipe that’s quick and tasty. It uses a coconut milk marinade for moist, delicious chicken. 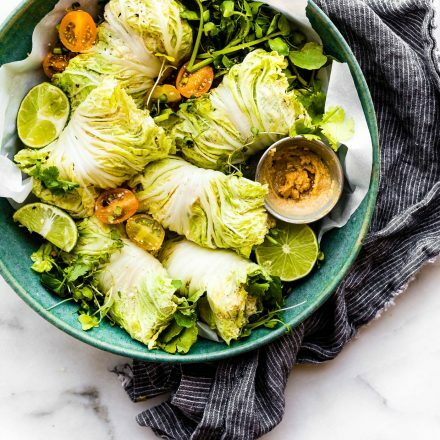 Top it with spicy mango chutney for an easy weeknight meal that’s healthy and nourishing. As you can tell, my husband and I love ethnic dishes. And apparently, I’m on a spicy ethnic cooking kick. 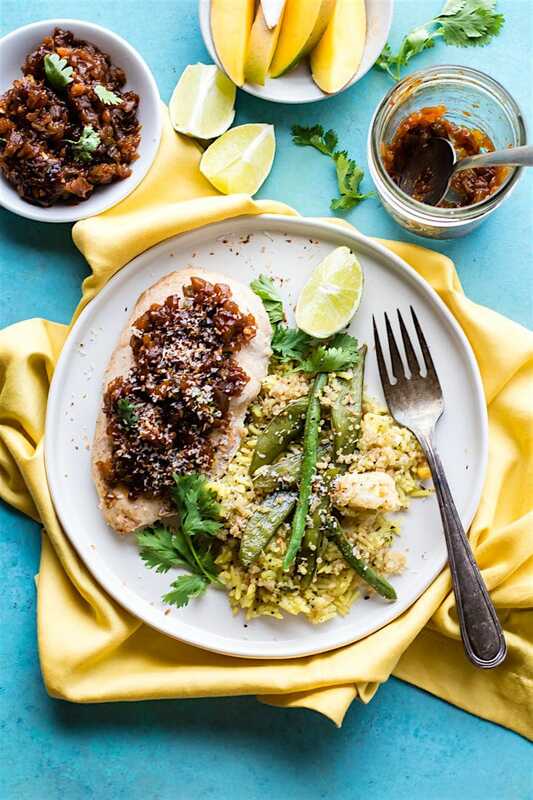 Thai, Mexican, and now this Indian inspired coconut milk chicken with jalapeño mango chutney. Oh yes, we love Indian spices and jalapeño in everything. POWER anti-inflammatory food combos if you ask me! Haha. But Y’all, I will confess, I half the reason I make these types of dishes are because…..
ONE –> I love the colors. I’m a visual person. The more vibrant the food, the healthier and tastier it is, right? 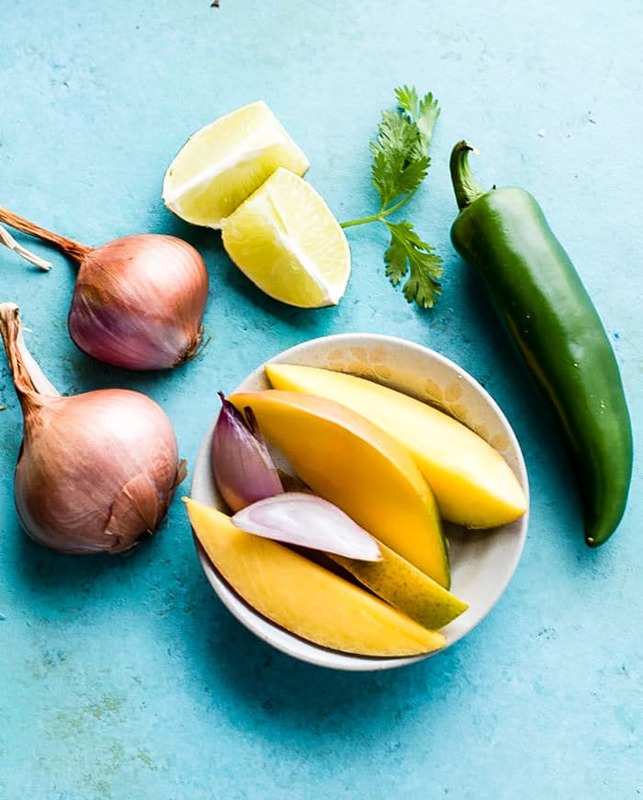 TWO —> These simple REAL FOOD ingredients combined make amazing flavors. And THREE —> I’m always surprised at just how quick and simple these type of dishes are to make. Yes, even despite how “technical” or “fancy” they sound . Oh and FOUR —> They are usually super easy to make food allergy friendly. Meaning gluten-free, Paleo, and/or dairy free. Bonus points for Cotter Crunch Readers! Which brings me to this coconut milk chicken with mango chutney. Seriously a match made in heaven, and it takes little effort. Have you ever heard of milk marinated chicken before? What about buttermilk chicken? No not buttermilk biscuits and chicken (although that sounds fab! ), but using actual buttermilk as a marinade. Well, this Coconut Milk Chicken is the same concept, but marinated with coconut milk, obviously. Can you marinate chicken in coconut milk?? Oh YES, yes you can!! Coconut milk marinade gives the chicken a sweet flavor while also making it extra moist. Marinating chicken in coconut milk will also help tame the mango jalapeño chutney if you decide to keep the seeds in. Which we did and LOVED! So ya, coconut milk is amazing in this Indian inspired dish. Spicy yes, but not overly spicy. Let’s talk about that mango jalapeño chutney and key nutrition points here. Coconut, mango, jalapeños, and fresh herbs, oh my! These are the perfect ADDITIONS to a pretty perfect balanced meal. Do you know that COCONUT MILK CHICKEN is rich in ZINC? Yes, and this zinc packed chicken (poultry) contains a protein that helps transport Vitamin A from Vitamin-rich foods such as mango and jalapeño. Which means you can improve your eyesight and read more of my posts. Haha, kidding. But really, how cool is that? Also, Mango is rich in magnesium and potassium. Totally need those electrolytes during the hot months! Phew! 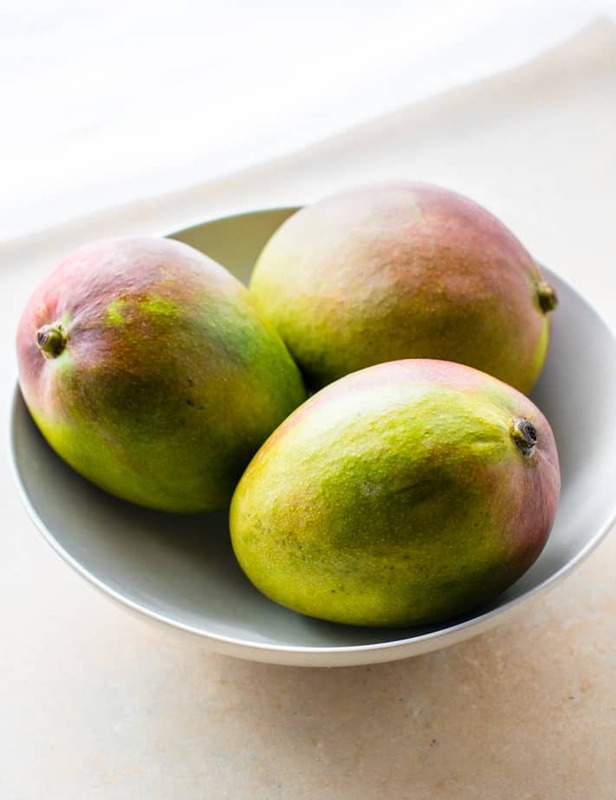 And lastly, Mango contains an enzyme that can help break down protein. See… now you know why this mango chutney is a MUST with coconut milk chicken. ALL the healthy digestion and feel good facts. Plus it’s just SUPER DUPER delicious. Yup! 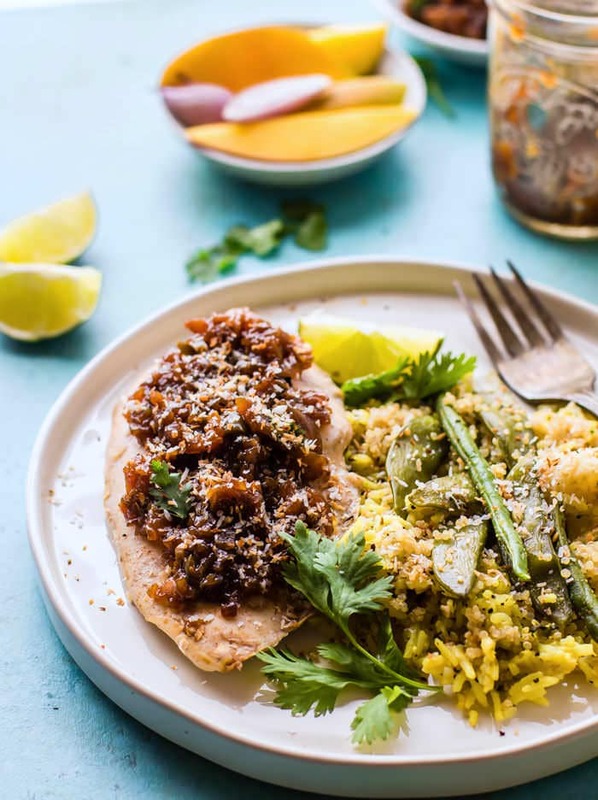 This Coconut Milk Chicken Recipe with jalapeno mango chutney is super easy, healthy, and makes it perfect for a weeknight meal. 1 jalapeno (chopped)- remove seeds if you don’t want spicy. First, place chicken in a baking dish or ziplock bag and cover with milk. Let it marinade in fridge for 3 hrs or up to 24 hrs. Once marinated, you can discard the coconut milk, reserving a few tablespoons. Then place chicken breasts in a skillet or in a baking dish with 1 tbsp oil. Sprinkle with salt and pepper. If cooking on stove top cook for about 20 minutes on medium high heat or until no longer pink inside and internal temperature reaches 160F. Add a few tbsp of the reserved coconut milk if desired, to moisten. If cooking in oven place in an oiled baking dish and cook in oven at 350F for 25-30 minutes. Feel free to add a few tbsp of coconut milk on top before baking as well. While the chicken is cooking, make your chutney and toast your coconut. Simply spread your shredded coconut on foil and place in oven for 1 minute or 2. No longer than 1 or 2 minutes because it will burn. You can also use a toaster oven. For the chutney See video in post or instructions below. Cut up all your veggies and mango. Place all in ingredients except cilantro in a medium pot. Cook on medium high until fruit and jalapeños softened. The mangos will start to brown. Be sure to keep stirring. Cook for about 15-20 minutes. 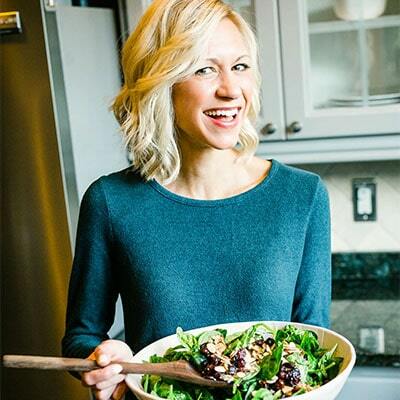 Remove and place all ingredients in a food processor. Pulse a few times until ingredients are mixed but still chunky and thick. Place 1/4 cup or less of chutney on cooked coconut milk chicken. 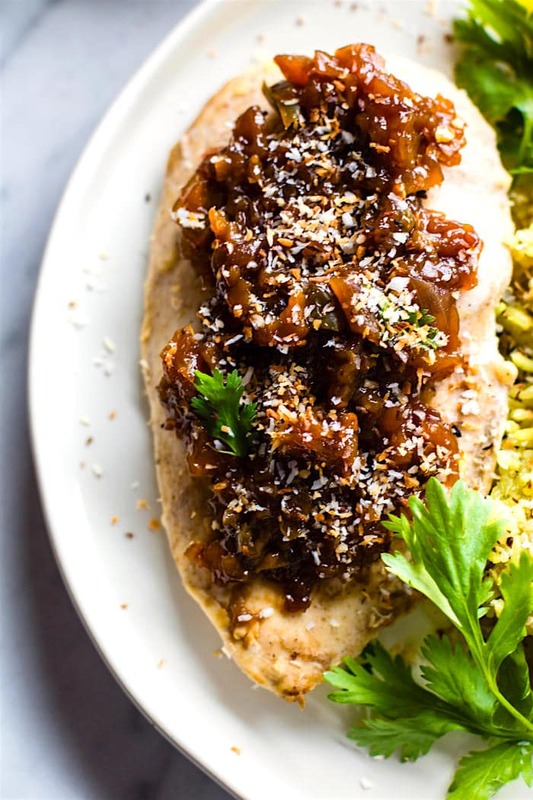 Sprinkle your toasted coconut and grated ginger on top of each chicken breast. Goes great with fragrant basmati rice and steamed veggies! Toasted coconut is optional but it does give a nice crunch! The chutney is great to make in a big batch or keep small batches in the fridge. Great on so many things! Nutrition shown below is for 4 oz coconut milk chicken with 1/4 cup chutney. Okay, so just because I LOVE YOU and I LOVE CHUTNEY, here’s a quick video on how to make it. You should know that adding the vinegar helps it last longer in the fridge. Plus it gives it a nice tang. WOO! love that! EAT UP Ya’ll! 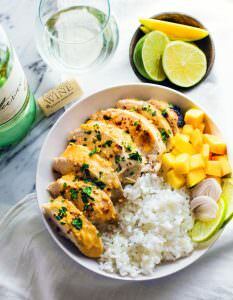 Marinated Coconut Milk Chicken with a little MANGO TANGO! Obviously, I love and ethnic flavors with marinated chicken. 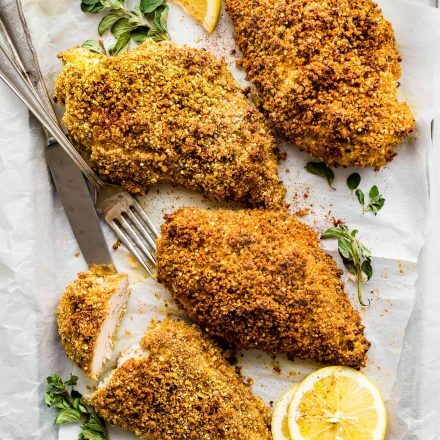 Here are a few more chicken recipes to try! 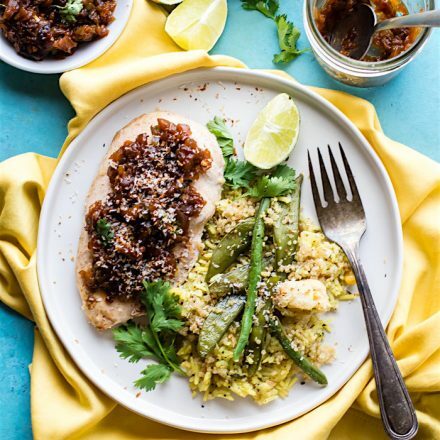 EASY Coconut Milk Chicken Recipe with Jalapeño Mango Chutney! 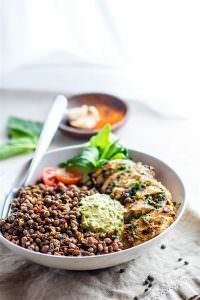 #Healthy, quick, DELISH! Now that I’ve blinded you with all colors from recipe photos, tell me… ever marinated chicken or another protein in coconut milk? Chutney fans.. are you? 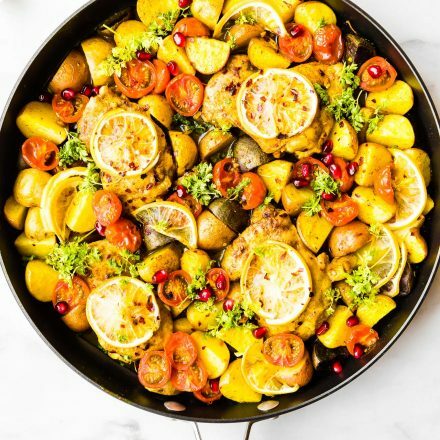 Love the colors in this dish and LOVE coconut chicken. Well, coconut in general but coconut chicken is delishhhh. right? so so good. I think you’d love. you are my food twin! One of my go-tos is marinating chicken in coconut milk! Tis so good! 100% with you on the vibrant dishes. The more colorful my food, the happier I am 🙂 LOVE mango and coconut together – can’t wait to try this! 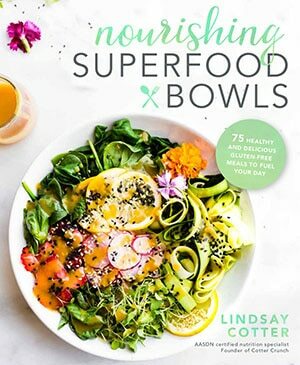 I am a sucker for a colorful meal too – we taste with our eyes as well! 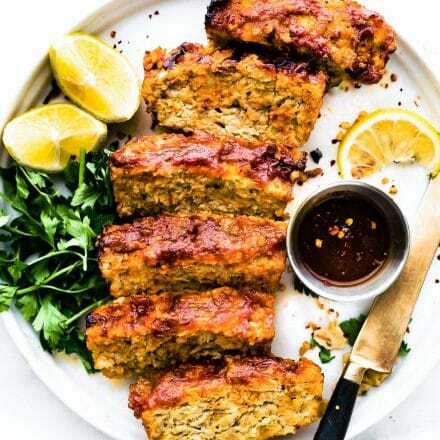 Love the coconut milk marinade – I literally just did that with chicken 2 nights ago. Now I want to try this idea… need to gather some mangos! So much goodness here! 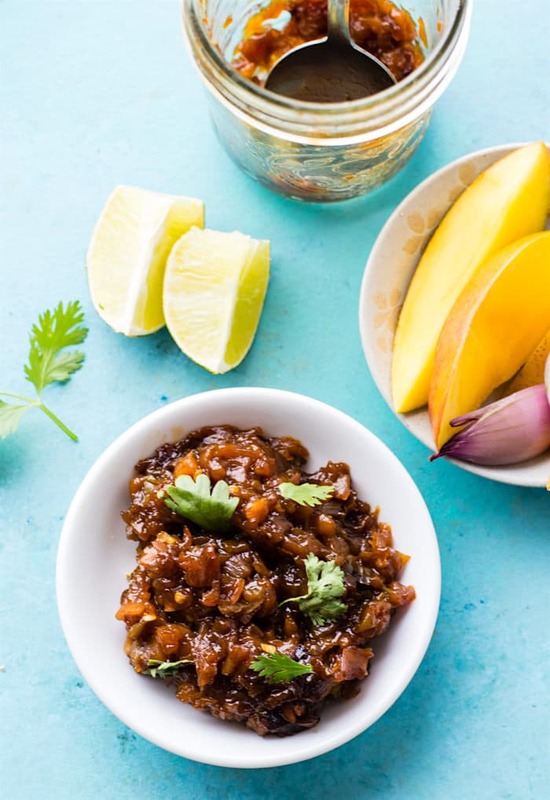 I love mango chutney, and any meal that sounds fancy but is actually EASY is my jam! I’m not sure if I <3 this scrumptious looking, spice filled chicken with jalapeno mango salsa or the fact that y'all luv ethnic eats more! I love Indian flavors! This is so colorful and HOW have I never made my own chutney?! Happening. I am just going to need you to move in while I do this whole 30 day leaky gut crazy diet. I think it all sounds super terrifying and hard, yet am somehow sure you could make it delicious. Yum! Love this flavor combo. I’m looking for new ways to spice up chicken! Gotta add this to my menu next week! This will give so much extra flavor to any dish! Glad I’m not the only one obsessed with coconut milk 🙂 What is your favorite brand in the States? I am not a big fan of the Whole Foods brand– honestly, they just taste better in Asia! have you tried the so delicious culinary coconut milk at whole foods? Or the trader joes? I love them both! The culinary one from so delicious is so convenient. and yes, i bet they taste 10x better in asia! haha. I also buy another one from asian market when i can. That one is legit. Oh chutney is one of my favorite ethnic condiments! It adds a really nice element of sweetness to any dish! Mango chutney is my favorite! I definitely have to try this one out! This was SO delicious! My husband and I each agreed it will go on the weekly menu. I made some coconut rice to go with it. I packed leftovers for lunch and I can’t wait to have it again!! Thanks for the great recipe!!!! Oh wonderful! yes, me too! Love this dish!